I can spend most of the price of a book having my photographs printed at 6x4 inch. Pulling them all together into a book then becomes cost effective and provides me with a neat storage solution. If I want to publish a more traditional book such as a collection of images some of publishers also provide eBook support. This is a great channel for photographers who want to share their work with others at a cost effective price. This led me to try out the eBook publishing on blurb using their BookSmart software and which was a great learning exercise. When I then upgraded my copy of Lightroom to V4 recently I was delighted to find it now included a Book module. These may seem like trivial points but I promise you they will make your life much easier in the publishing process. 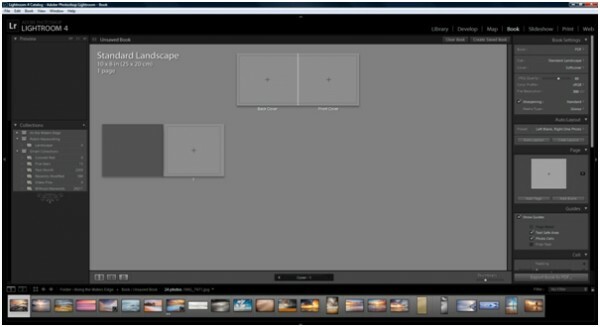 Below is the layout of the book module which is accessed through the shortcuts on the top right of the Lightroom screen. It’s quite probable that your screen won’t look like this the first time you access this as the default is set to automatically import images from your selected catalogue in order to create a book. You may therefore find it easier to turn this off when the dialog box is presented on entering the module. You can also access this option in “Book Preferences” found under the “Book” menu. 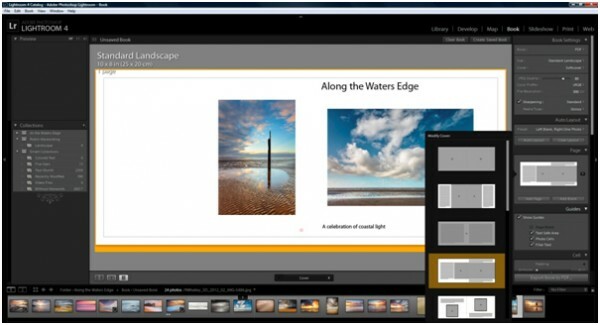 On the left side of the screen you will see Lightroom collections which you can use to select the images you want to include in your book. My tip however is to place all your prepared images into a single folder and import your folder into the Lightroom Library. With this folder selected, when you switch to the Book module all the images appear along the bottom of the screen as thumbnails. 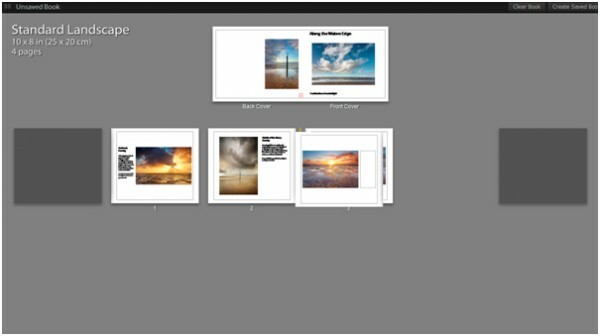 You are then able to easily select images to include it in your book. On the right side of the screen you have a number of options relating to the formatting and creation of the book. We will look at these in greater detail later in the article. The main centre area of the screen shows the pages in the book and provides information about the selected design/layout. The screen illustration above shows the multipage view but this isn’t the best view to use when creating the book. I find the double page or single page views much better for editing. You can select these by clicking on the icons to the bottom left of the main part of the screen, just above the Thumbnail strip. The first task is to determine how you will publish your book. Two options are available; blurb and PDF. If you are not familiar, “blurb” is a print on demand publisher through whom you can print and publish single or multiple books in both printed and iPad format. I have used them myself and they are a great solution for printing and storing your very best images as a replacement for the old photo album. If you want to publish your finished book in electronic format without going through blurb you can select the PDF option. Once you have selected the appropriate format and layout for your book the basic skeleton of the book will be created automatically. It’s then time to start adding images and text to the pages of your book. If you haven’t already done so I suggest switching to the two page view as described previously above. If you then need to move to other pages in the book you can move through them sequentially using the navigation button below the centre part of the main area, above the thumbnails. Alternatively you could switch back to the multipage view to make selection easier. I find the easiest method of adding images to my pages is to select the page and then drag and drop the thumbnail on the page in the image container. When you do this you will see the image is added but Lightroom fills the image container with the image. This behaviour can be changed by right clicking on the image and checking or un-checking the “Autozoom” option depending on what you want. 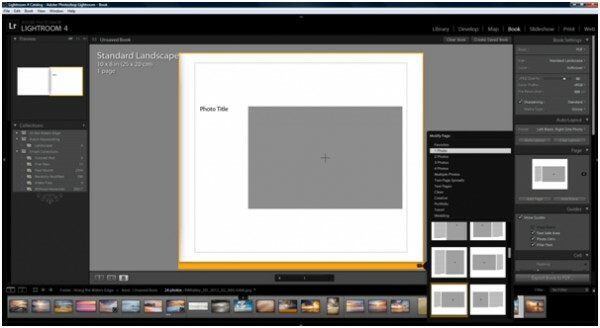 Once you have your images in place it is possible to resize the image container by clicking and dragging it with the mouse. Around the currently selected screen you will see a yellow/orange border. To the bottom right of this there is an arrow that when clicked displays the layout options for the type of page you have selected. Click on another design to select it. I suggest you look through these before you add images and text to your book as changing the layout can cause you to lose information. If this happens to you use the Undo function in Lightroom. Select the “Page” option in the panel on the right of the screen. Once you have completed the current page, move to the next one using the navigation at the bottom of the screen. If the layout doesn’t match your needs change it as described above. 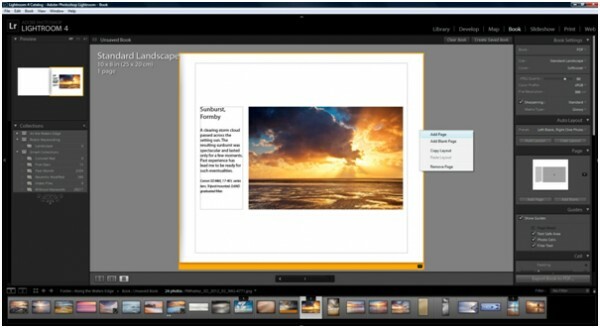 In the following screenshot you can see a Landscape orientation image page that provides text to the left of the image. A similar layout is also offered but with the text to the right of the image. If you intend to print your book using blurb you should consider which of the layouts is suitable. Remember, because a printed book is bound along the spine you might want to place the text on the outside so would use both of these layouts. Adding further pages is also easy. Simply right click on the current page and select “Add page” from the popup menu as shown in the screen shot below. You can also see from this screenshot that I have added text to the page to describe my image. This is done by clicking on the text area on the page and then typing. You could of course also type your text in a word processor and the copy and paste it into these text areas to ensure the spelling is correct. One of the current limitations of the Book module is that it doesn’t have a spell check facility. If you want to format your text you can do this by selecting text with your mouse and then use the options in the “Type” panel on the right of the screen. In my example I have made the title larger than the body text and the technical information e.g. camera settings smaller and italicised. As with other presets in Lightroom it’s possible to save these for future use which helps speed up the book creation and allows you to standardise the look. If you have changed the format of any of the text in your book you will notice the “Type Style Preset” in the right hand panel will have changed to “Custom”. If you click on the word “Custom” a drop down list will appear providing the option to save the current settings as a new preset. All the images work together as a group, but if you followed my earlier tip of preparing and grouping your images this shouldn’t be a problem. The images are in the correct order so that each one supports the previous one and prepares the viewer for the next. Once you have done this you might feel you need to move some of the pages around. I find the easiest way to do this is to switch to the multi-page view by clicking the icon in the lower left of the screen (see earlier in this document). You are then able to drag and drop individual pages around to re-order them within the book as shown in the screen shot below. As a finishing touch to my book I decided to add a copyright notice to the bottom of each page together with a note of my web site address in case anyone wants to contact me. This was done by adding a Caption to the page which you will find in the “Caption” section of the panel on the right. Click the option to add a Page Caption and select either top or bottom and the size of the text. This will activate the caption text area on the page and you can enter your text. Having completed your book, it’s almost time to publish. Before you do so however it’s a good idea to create a saved copy of the book. You can do this by clicking on the link “Create Saved Book” which is to the right hand side of the screen just below the menu. Once saved your book will appear on the left hand panel under the “Collections” drop down. If you have multiple saved books you can simply click on the one that you want to open to work on. Finally, to publish your book you will find a button at the bottom of the right hand panel. If your book is in PDF format it will say “Export Book to PDF...” or if you are publishing to blurb it will say “Send Book to Blurb...” If you do intend to publish your book using blurb you will need to have created a blurb account first. As my book here is in PDF format, clicking the “Export to PDF...” button will display a Save dialog where I can enter the name of the pdf file to be created and its location. Once you click “Save” your book will be created. One of the few disappointing aspects of the Book module is that it doesn’t provide any security features in the PDF file to prevent people copying the images. If having created your pdf book you decide you want to implement further security to protect your work you could always open and re-save the file using other software that supports the security features in PDF. There are many freely available tools that allow you to do this but it would have been nice to not have to switch out of Lightroom for this. 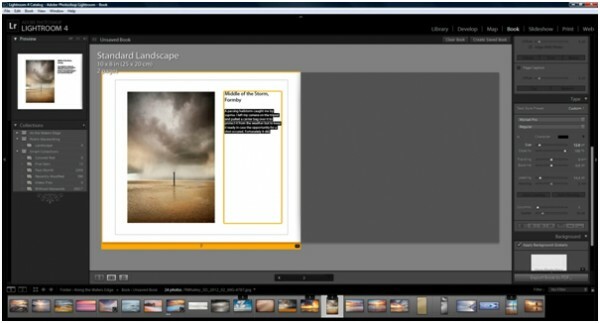 If having read this you decide to create your own PDF book in Lightroom why not share the link. It would be great to see other peoples work in this way. If you are going to be be publishing a print book be sure to Soft Proof your images and implement good Colour Management. You can use the Popular Tag cloud top right to find related articles.